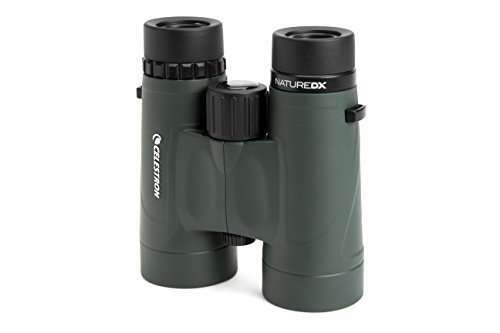 Binoculars with an 8×42 configuration is one of the popular sizes that birders and hobbyists used in their activities. In our research, one of the most bought models in this size is the Celestron Nature DX 8×42 binocular. 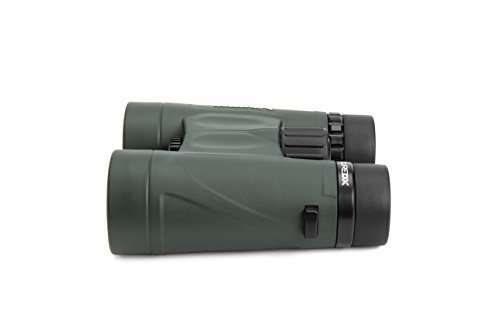 We shall go through and have a comprehensive review of this binocular and you’ll see why and how this is one of the popular models out there. No Time To Read Our Full Review? 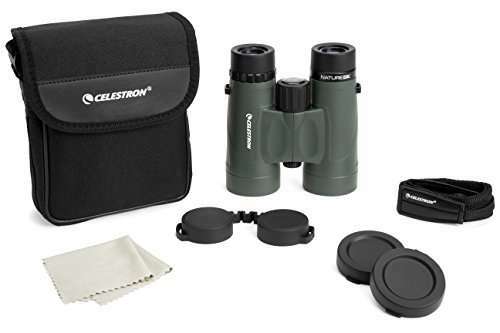 Check Out The Celestron Nature DX 8x42 @ Amazon! What Are The Features & Specifications of The Celestron Nature DX 8×42 Binocular? This binocular is designed with the beginning and intermediate users in mind. If you are just starting out a hobby and would be needing a pair of binoculars, this is a great model to try on. It is affordable with loads of features and real easy to use. The views that you would see from this binocular would rival those expensive ones. BaK-4 prisms with phase-correction coating. This increases contrast and resolution for a sharper and more detailed view of images. With fully multi-coated optics. This enables more light transmission producing brighter images and quality detail compared to single-coated optics. A 6.5 feet (or 2 m) close focus. With this capability, you can perform up-close observation of birds, plants, insects and other interesting objects. It is compact and a real lightweight. With its dimension and construction, this binocular is pretty compact and weighs really light – only 629 grams! It won’t cause you soreness carrying it around for a while. It is waterproof and fog-proof. No need to worry about water ingress and foggy lens as the housing of this unit is purged of air and filled with nitrogen. Twist-up eyecups. This feature creates a very comfortable viewing experience for users including those wearing eyeglasses. Durable housing. This model has a rubber-armored polycarbonate housing that is very tough and robust which will protect your binocular from damage. The sides and the top of the binocular have grooved portions that makes it more comfortable to hold. Objective lens diameter of 42 mm. A 42mm lens diameter is a popular size of choice for birders and other enthusiasts, so you’re in good company! Magnification power of 8x. Using this binocular, you can magnify your object view up to 8 times which is already a great range for viewing. Field of view of 388 feet (129 meters). Although the FOV of this unit is a bit less compare to its counterpart from Nikon, the Monarch 7 8×42, it is wide enough to let you have an enjoyable viewing experience. Length x Width x Height Dimensions in inches: 5.3 x 4.9 x 2 (or 135 mm x 126 mm x 52 mm). With this dimension, you could see that this binocular is not bulky and not a hassle to carry on. Has an angular (or apparent) field of view of 7.4°. This value already sits in the wide FOV category. Has an exit pupil diameter of 5.25 mm. Has an eye relief of 17.5 mm. For those wearing eye glasses, the minimum advisable eye relief is 15mm which means this binocular is suitable for you to use. IPD Min/Max of 56/74 mm. It is important that the ocular lenses line up perfectly with your pupils so you don’t get a dark halo forming around the image. This bino has a minimum interpupillary distance of 56mm and a maximum of 74 millimeters. The average distance between the eyes of men in the US is just under 6.5cm, whilst for women it is just over 6.2cm so this Celestron Nature is generally suitable for most people. Has a twilight Factor of 18.33. A twilight factor of 17 or better is usually required if you are going to use this in low light conditions. Has a relative brightness of 27.56. This number indicates that this is a bright binocular. The greater the relative brightness is, the brighter the image will be. Take note though that superior optical design and high quality coating greatly contribute to the actual brightness of binoculars. Adaptable to use with a tripod. This unit can easily be mounted on a tripod using the standard ¼” thread connection located on the front face of the central hinge. What Accessories Are Included When You Buy The Celestron Nature DX? Neck strap. 25mm wide and 1mm thick. Provides ease of handling when you’re using your binocular. It is not as great as those padded ones but suits the purpose. Objective lens caps. These cover the objective lens. They have a loop part that attaches to the outer covering of the lens which makes it easier to cover the binocular if you’re not using it. Carrying case. The case provided in this pack is soft with a fairly light padding. The binoculars fit nicely inside even when the lens covers are attached. There is a pocket on the front face that is ideal for small items as well. Lens cloth. Fairly good quality cloth which is just ideal for basic cleaning. Instruction manual. Everything you need to know on how to use and maintain your Celestron Nature DX binocular can be found in this manual. There are various language translations as well. 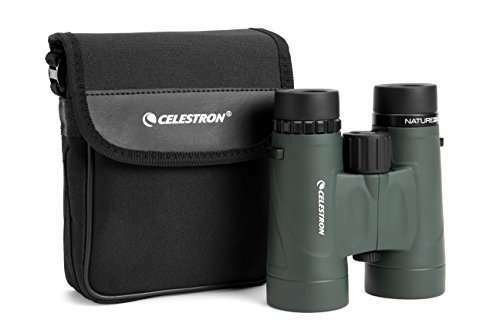 What Is The Price of The Celestron Nature DX 8×42 Binoculars? If you’re going to look at all the features and the quality of the product, you might say that this would be priced at an easy $500. You would be surprised to know that it is actually below $200! Depending on where you’re going to buy it from, the price range can be between 120 to 160. “My eyes didn’t sink into the image as much as they did with the Nature DX”. One user has tested several binoculars, of various sizes and brands, and he came to this conclusion. The images are as sharp as any of the other binos he tested. Note that the other binoculars he tested were on the top end so that means the quality of the Celestron Nature DX is comparable to those high-priced brands. Below is our product summary for the Celestron Nature DX 8×42 binocular and conclusion based on the features and actual user feedbacks. This binocular possesses great qualities that can rival other higher-priced binoculars. It produces clear and sharp images and is ideal to use for bird watching, nature sight-seeing and other day-time activities. It may not be good to use for stargazing though and other ventures with low light conditions. It has a field of view that is wide enough to see fast-moving objects. It is easy to use & adjust and included some really handy accessories. A really cheap price (and a bargain at that) compare to its features and capabilities. Users have actually rated this binocular pretty high at 4.6 out of 5 stars. This can be attributed to the fact that the Nature DX has a really great performance in the field based on their different and various experiences. If you’re situation is one of the above then this model is a great way to start. We believe so because it is packed with awesome features that will make you enjoy your hobby and viewing all those amazing images without burning your pocket! 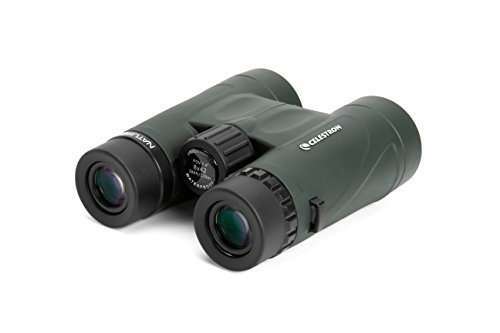 Click Here To Buy This Binocular @ Amazon!